Black Darter (Sympetrum danae). Immature male. Taken at Foulshaw Moss, Cumbria, on July 2nd 2016. Approx 4.6 lifesize. Immature male. Taken at Foulshaw Moss, Cumbria, on July 2nd 2016. 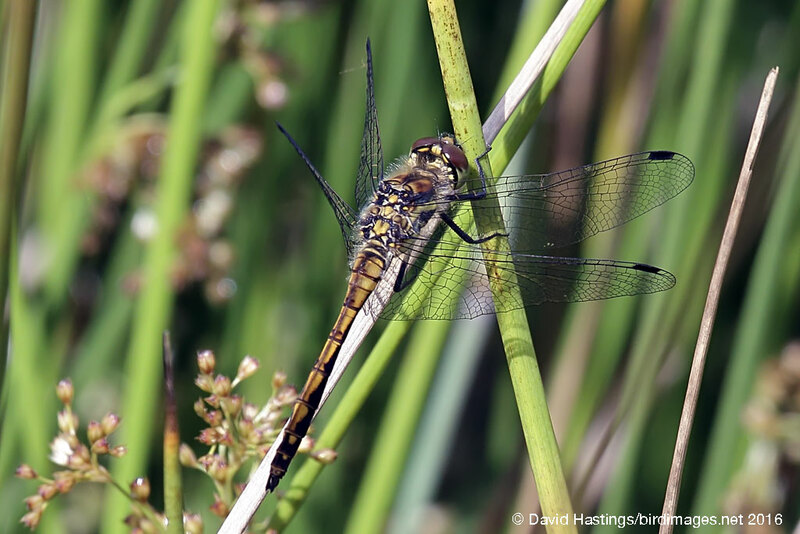 Britain's smallest dragonfly is a late summer species of heathland and moorland bog pools. It is the only Sympetrum species where mature males do not turn reddish. It has black legs and black pterostigma. Very locally distributed in the lowlands, but more widespread in the uplands of northern and western Britain, and in Ireland. Restricted to acidic shallow pools, lake margins and ditches in lowland heathland, and moorland blanket bog. The flight period is relatively late, from mid-June to November. It has a rather skittish flight action. Males are not strongly territorial.